The finale of The Walk qualifies as a true astonishment, a stunning recreation of Philippe Petit’s 1974 wire walk between the Twin Towers of the World Trade Center. Director Robert Zemeckis employs 3D, IMAX, CGI and heaven knows what else to make us feel what it was like for Petit to step onto a wire 110 stories above the bustle of lower Manhattan. Now, I can’t say that this was a feeling that I ever wanted to have. As a person who’s squeamish about heights, I can tell you that I found the last act of Zemeckis’s movie as terrifying as any experience I’ve had at a movie. Those scenes, however, remind us that movies are capable of immersing us in experiences that are entirely sensory — in this case, making us feel as if we, too, are stepping onto a wire suspended between two monolithic skyscrapers. 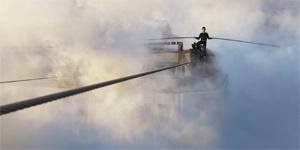 The movie doesn’t always soar in other areas, so whether you want to see The Walk depends on whether you think Petit’s wire-walking escapade proves involving enough. It was for me. Was Petit’s famous wire walk a work of art, a dangerously illegal expression of massive irresponsibility, or an act of daring so exceptional that it transcended all categories? I honestly don’t know, but like most moviegoers I’m familiar with the details of Petit’s story because of James Marsh’s 2008 Oscar-winning documentary Man on Wire, a movie that told the story of Petit’s obsession. Marsh recreated the various ruses Petit employed to gain entry into the World Trade Center so that he could string his wire. He used still photos to show Petit’s walk. I happened to live in New York City at the time Petit made his famous walk. Contrary to what Zemeckis’s movie contends, Petit did not soften my view of The World Trade Center. I always thought the towers were cold, imposing and lacking in architectural elegance and invention. Early on, Zemeckis operates in exaggerated fanciful mode, introducing us to Petit (Joseph Gordon-Levitt) as he stands on the torch of the Statue Liberty, the perch from which he’ll provide the tale with its intermittent narration. He talks directly to the camera. I can only surmise that in the wake of Sept. 11, Zemeckis places Petit atop the Statue of Liberty to show that the ideals of freedom have survived, even though the towers have not — not that Zemeckis makes any other references to the ultimate fate of the towers. He knows we know, and leaves it at that. Speaking with a variable French accent, Gordon-Levitt displays an unbridled exuberance that mirrors the movie’s buoyant tone. Aside from an occasional angry outburst and one moment of sweaty panic, he’s pretty much stuck in over-drive. During the early ’70s, we see Petit working as a street performer in Paris. He juggles atop a unicycle, walks a wire strung between trees and offers constant explanations for why he’s speaking English. He’s preparing to visit America, he tells anyone who asks. Petit decided his destiny involved making this particular walk the minute he saw a picture of the then-proposed towers in a magazine in a dentist’s office. The performances surrounding Levitt, notably that of Charlotte Le Bon as his girlfriend Annie Alix, truly can be deemed "supporting;" other characters exist as props either to bolster Petit emotionally or to help him plan and execute his walk. Zemeckis treats the latter part of The Walk as a caper film. To augment the illicit feeing that accompanied Petit’s efforts, he refers to his helpers as "accomplices." The mid-sections of the film introduce us to Papa Rudy, a circus wire walker played by Ben Kingsley. Papa Rudy tries to instill Petit with the ethos of a wire walker, as Kingsley struggles to transcend the stereotype of a gruff but caring mentor. Because Marsh’s documentary didn’t try to make us feel as if we were on the wire with Petit, it did a better job of taking us inside Petit’s mind, exposing us to what he regarded as a mixture of art and performance — or, to put it another way, a magical piece of performance art. The Walk isn’t a great movie, although it boasts a truly great recreation of an event with which younger audiences may not be familiar. Those who know Zemeckis’s work (from Back to the Future to Who Framed Roger Rabbit to Forrest Gump to Cast Away and The Polar Express) know that he makes little effort to hide his delight in artifice. That tendency doesn’t always serve him well in The Walk, which is at its best when Petit is alone on the wire, creating his "poetry." For all the technical wizardry required to create those moments, they don’t feel nearly as self-conscious as much of what we’ve been watching. Aside from the excruciating tightening of the gut I experienced during Petit’s prolonged wire walk, what I’ll most remember about The Walk is an image of Petit reclining on the wire as we hear him talk about the profound silence and serenity that are encompassing him, an unearthly stillness. I can’t begin to imagine what might have been going on Petit’s head normally if this is how far he had to go to find such tranquility and grace.